This, the first Persian manuscript to enter the Vatican Library, may well have been acquired by the Chaldean metropolitan Mar Yosef, who came from Malabar to Rome in 1568 to clear himself of the charge of Nestorianism. Written in the cursive "naskhi" script typical of the Middle East, it is one of the earliest surviving Persian manuscripts of any part of the Scriptures--none are known to be earlier than the fourteenth century. The rarity of the manuscript was quickly appreciated. The Persian scholar Giovanni Battista Vecchietti consulted it when he was in Rome in 1598 and foliated it. 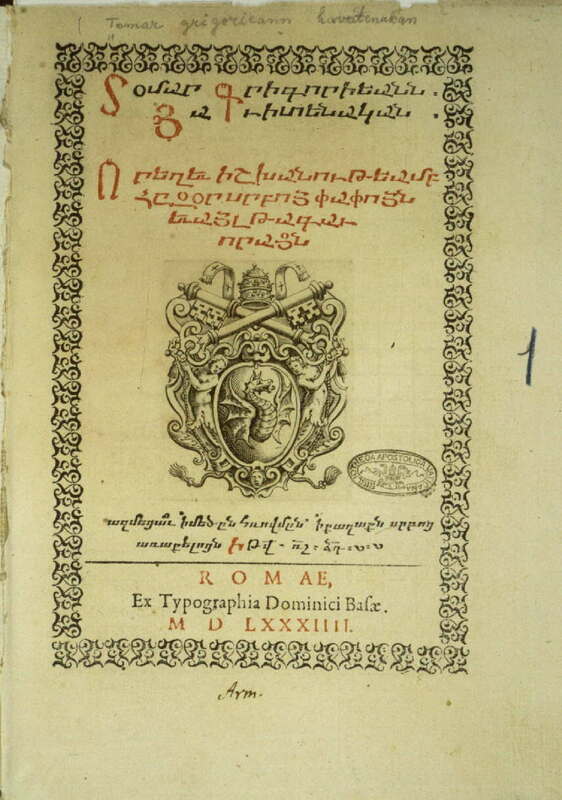 It was also read and copied by Tumagen, an Armenian from Aleppo who probably arrived in Rome in the train of Leonardo Abel after his mission to Syria in 1586. 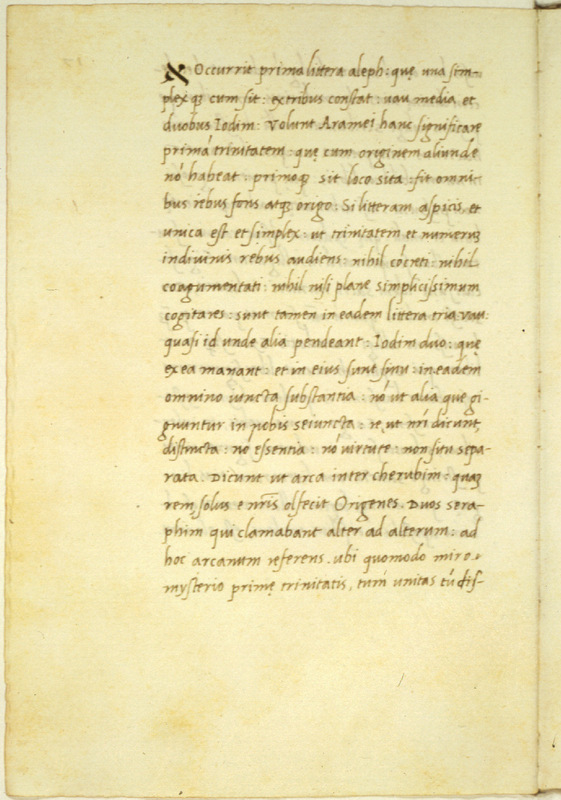 The page displayed here includes the opening of the text of the Gospel of Matthew. This fragment of the medieval love story of Bayad and Riyad may have been taken from Tunis by the troops of Charles V. It is one of the rarest and most singular Arabic manuscripts in the Vatican collection. 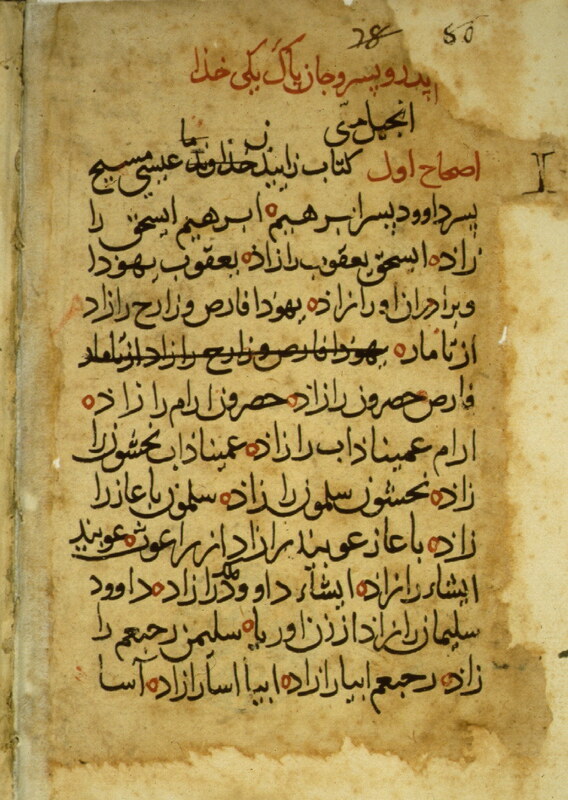 Written in "maghribi" script, it was probably copied in Spain in the first half of the thirteenth century from an eastern manuscript of the Baghdad school. The miniaturist, however, adapted the original illustrations to a wastern setting and changed oriental architectural details to Spanish ones. This codex remains one of the only known examples of Muslim figurative painting in Spain. 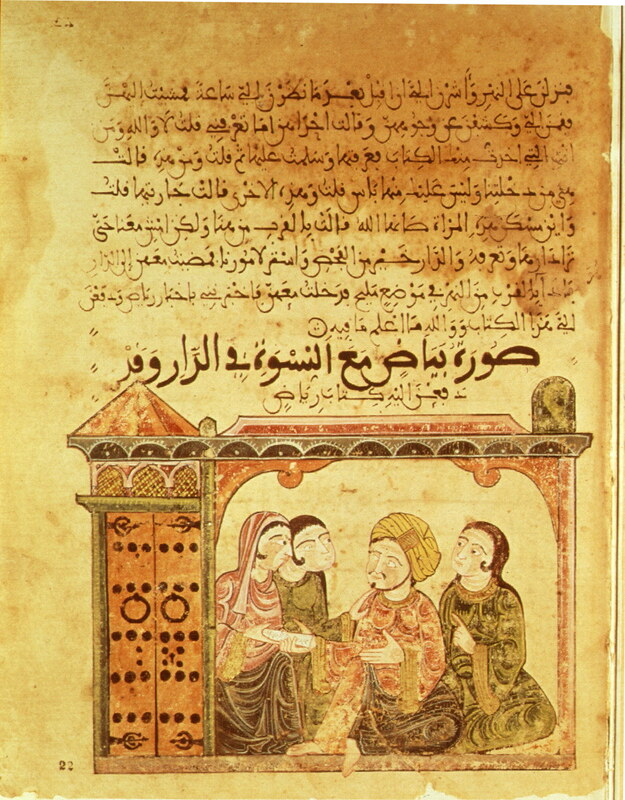 In the page shown here, we see Bayad receiving a letter from Riyad in the house of three women. The appearance of the house is clearly western rather than eastern. See Ugo Monneret de Villard, "Un codice arabo spagnolo con miniature," _La Bibliofilia_ 43(1941):209-23. One of the first Quranic manuscripts to enter the Vatican Library, this codex comes from a "madrasa" or mosque school in Tunis and was probably taken when the troops of Charles V captured the city in July 1535. 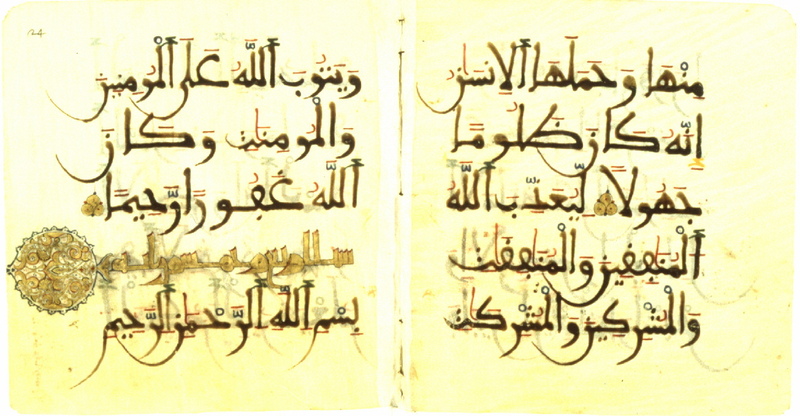 A fine example of the "maghribi" script typical of northwest Africa and Muslim Spain, the manuscript also contains good illuminations. It is only a fragment of the Auran, from sura 33:31 to sura 35:45 (part 22). The pages shown here bear the last two verses of sura 33 (verses 73-74). This Armenian translation of the Gregorian calendar was printed by the Vatican press run by Domenico Basa with the Armenian types which the French typographer Robert Granjon had designed shortly after his arrival in Rome and shown to Pope Gregory XIII in 1579. A copy of the calendar was given to the Armenian patriarch Azarias by Leonardo Abel toward the end of 1584. The title page shows, beneath the title, the coat of arms of Gregory XIII's family, the Boncompagni. 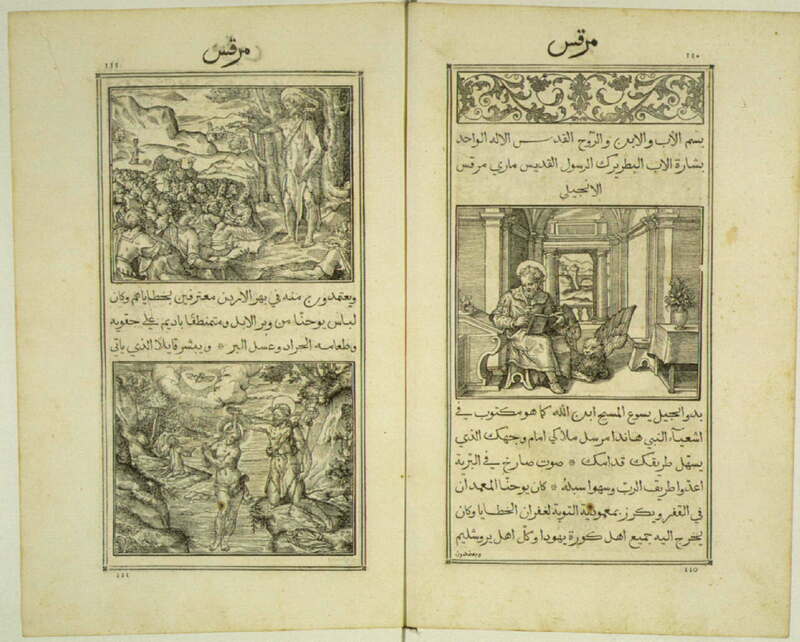 The Medici Press was founded in 1584 to produce a polyglot Bible and works in other languages, especially Arabic. Its first great Arabic publication was this edition of the Gospels, bearing the date 1590 on the title page, and 1591 at the end. 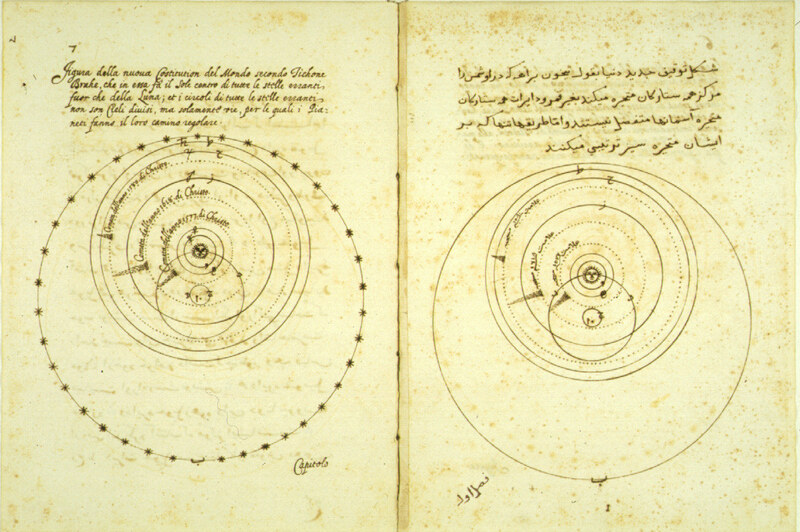 Two versions appeared, one solely in Arabic and one with an interlinear Latin translation. The Arabic types were cut by Robert Granjon. The 149 woodcuts with which the book is illustrated were probably made by Leonardo Parasole after designs by the Florentine artist Antonio Tempesta, known for the frescoes he painted in the Vatican and numerous Roman palaces. The pages on display here show the first chapter of Mark, verses 1-6, and include three woodcuts depicting, on the right, the Evangelist with a winged lion and, on the left, John the Baptist preaching. The woodcut below pictures the baptism of Jesus Christ. This manuscript is one of the finest surviving Coptic codices of the Middle Ages. Copied in Cairo, it was once in the library of the monastery of Saint Anthony in the desert near the Red Sea south of Suez. It was taken back to Cairo in about 1506 and, thirty years later, was transferred to the church of Saints Sergius and Bacchus in Alexandria. There is was purchased by Girolamo Vecchietti in 1594 for the director of the Medici press, Giovanni Battista Raimondi. It was left to the Vatican Library, together with Raimondi's other Coptic manuscripts, on his death in 1614. 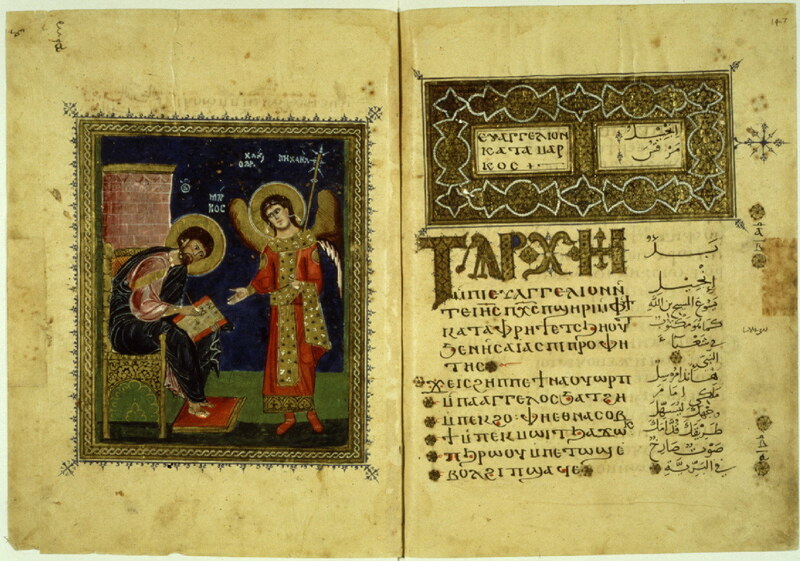 This codex includes both a Coptic version of the Gospels, translated from the Greek and written in an uncial script, and an Arabic translation. 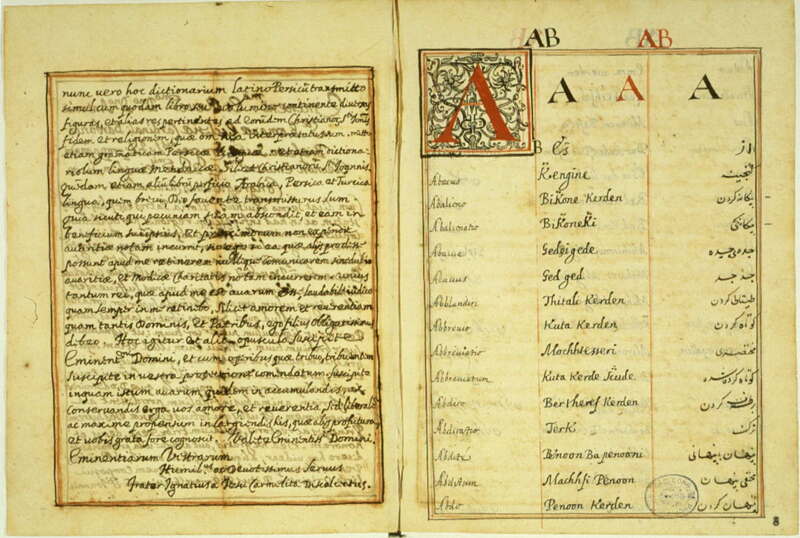 The manuscript begins with Eusebius's epistle to Carpianus and also contains the Eusebian and Ammonian canon tables. In the Byzantine tradition each Gospel is preceded by a historical preface stating when and where the Gospel was written, making the codex of particular interest. The manuscript is richly illustrated and illuminated, partly by the scribe Georgis and partly by another artist. The ornamentation frequently shows Islamic influence, but the illustrations are Byzantine in style. The pages on display show the opening of the Gospel of Mark (verses 1-3) on the right. On the left is the Evangelist writing the first word of his text, and beside him stands the archangel Michael. See Jules Leroy, _Les Manuscrits coptes et coptes-arabes illustres_ (Paris: Paul Geuthner, 1974), 148-53. Many Christian intellectuals believed that the medieval Jewish mystical tradition of the Cabala provided powerful truths about the Bible by identifying the secret meanings of the Hebrew letters in which it had been written. Here Giles of Viterbo, an important member of the curia, explains the secrets of the Hebrew alphabet to cardinal Giulio de' Medici (later Pope Clement VII). While inspecting the famous Palatine Library of Heidelberg, confiscated as spoil of war by Maximilian I, Elector of Bavaria, and presented to Pope Gregory XV in 1623, the papal librarian Allacci wrote Cardinal Ludovisi that amongst the notable objects was "a mass of palm leaves" ("uno mazzo di palme") whose language and content he did not know. 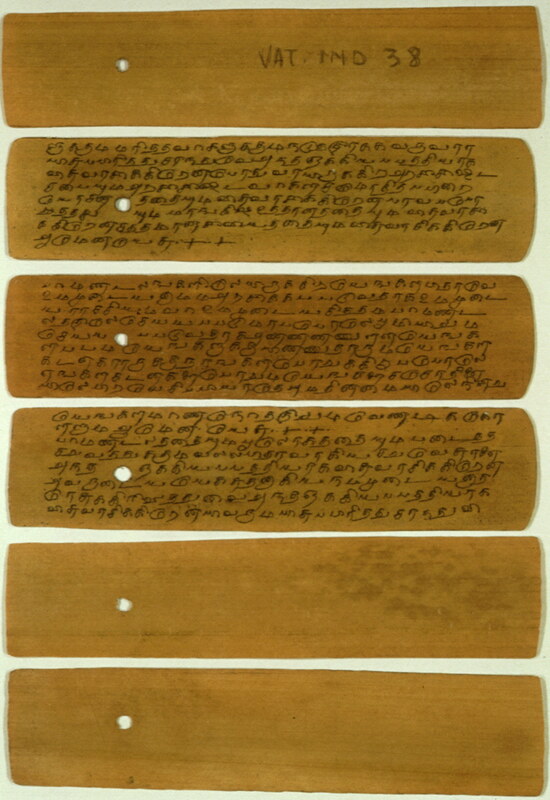 It was a small collection of Christian prayers in Tamil entitled "Tamil mantiram" (Tamil prayers), which could be either the work of missionaries of the Counter-Reformation or an older composition from the ancient Christian communities in South India. The accompanying note, of unknown date, labels it as "carmina in lingua japanica" (songs in the Japanese language), which shows the difficulty of identifying works in "exotic" scripts before the additional growth of Oriental studies in the nineteenth century. By the time of the Counter-Reformation, the Catholic church had become suspicious of vernacular translations of the Bible and missionary literary efforts were more likely to be directed towards such genres as lives of the saints, catechisms, and controversial works. Some of these were preserved in Rome because they were written there, some because they were sent back there as testimonies of the missionaries' labors, and some because it was planned or hoped that they be printed and they needed to be vetted for theological correctness. 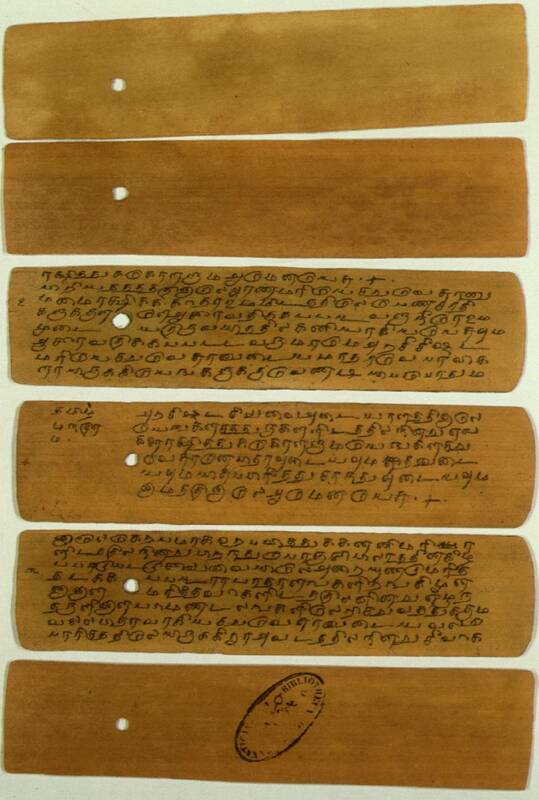 The anonymous "Vitae 13 sanctorum," written on palm leaves in Tamil, a language spoken in Southern Indian and Sri Lanka, is a verse work on the lives of the Apostles. It appears to date from the seventeenth century, before the papacy of Pope Alexander VIII Ottoboni (reigned 1689-1691) whose arms appear on the European leather box made for it. Pietro della Valle translated and condensed the "De tribus coelis" of Christoforo Borri, S.J., into Persian in Goa, India, in 1624 and into Italian in Rome, in 1631. This is a diagram of Tycho Brache's compromise scheme for a cosmology. The sun revolves around the earth as it traditionally had, but the planets revolve around the sun. Also shown are the locations of several comets whose courses were calculated to cross the courses of two or more planets and proof that they could not be carried by crystalline spheres. The author, Pietro della Valla was a rich Roman noble whose linguistic skills and bravery as a traveller were as remarkable as his circle of friends. The Italian missionary priest Ignazio de Jesus (died 1667) dedicated this Latin-Persian dictionary to Cardinal Antonio Barberini (1607-1681), Prefect of the Congregation for the Propagation of the Faith, the new division of the curia in charge of missionary efforts. Unlike the author's Persian grammar, this dictionary was not printed. Father Ignazio lists Latin words alphabetically in the first column, gives the Persian equivalent in a Roman script transliteration (representing sounds not in the Roman alphabet by the addition of diacritic marks derived from the Persian version of the Arabic alphabet), and finally gives the Persian written form. This is a rare, ink-squeezed rubbing of the top portion of a ninth-century stone monument discovered in 1625 in a Christian graveyard in Sian (Xi`an). Initially studied by Alvaro Semedo, it was later featured in Michael Boym's many writings and in Athanasius Kircher's influential "China illustrata." Nestorian Christians had scattered throughout Asia in the fifth century A.D. and were reported in early sources of Chinese history. 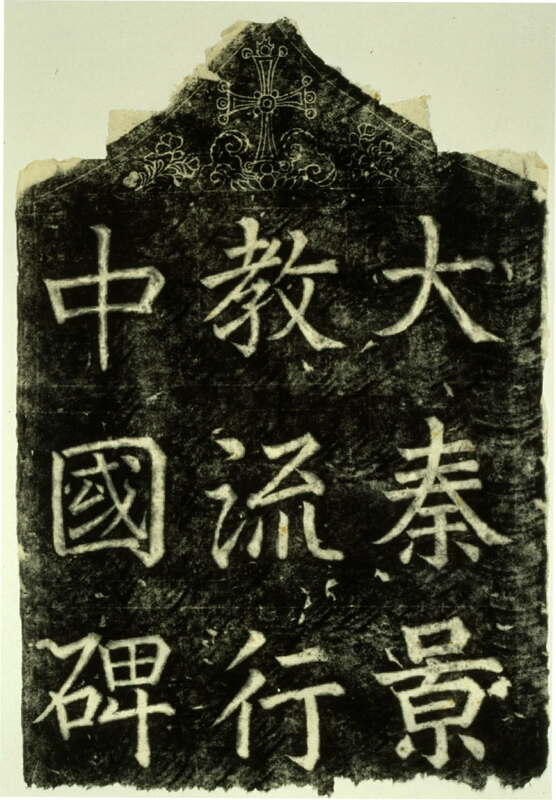 This stele, with its long explanation of Nestorian theology and history of the religion in China (with Syriac bilingual transliterations of names), caused a sensation in Europe on its discovery in 1625. The tablature seen here (which capped the nine-foot monument) reads: "A Memorial Stele [honoring] the Flowing into China of the Illustrious Religion from Great Ch`in." Great Ch`in was a traditional Chinese term for the Roman Orient. The original monument exists today in Sian's Museum of Stone Tablets; a full-size replica is in the Musee Guimet in Paris. This room is divided into two parts by a painted wall. Do you want to have a look at other side of the wall, or go back to the Main Hall? There is also a small chamber with extra objects.